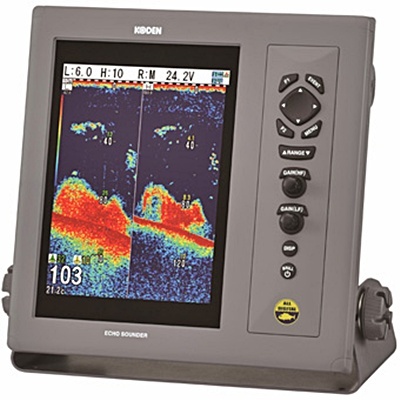 Digital 10.4" Dual-Frequency Color LCD Fishfinder. Digital eye can see deep sea world! Superior clutter suppression and signal to noise ratio, faster update rate for increased performance in shallow water. Detect fish close to the bottom at depth never before possible with the high frequency transducer. The affordable 1kW CVS-1410 series equals or beats the performance of the conventional sounders with 3 times the power output. 10.4-inch Digital Echo Sounder comes in two models: cost effective CVS-1410 as standard model and CVS-1410HS as high sensitivity model. You can choose either CVS-1410 or CVS-1410HS depending on your target fish, fishing method, fishing area and usage. Know exactly the bottom area covered by the low and high frequency sound beams. This can help you target the fish directly under the boat or off to the side. Stores up to 10 screen images in built-in memory for recall later by a single touch. Exclusive Sona-Tone identifies what’s under your boat with different sounds for fish and schools of fish. Takes the guesswork out of operating the sounder. Even a novice user can achieve professional results by letting the CVS-1410 pick the optimum settings for such functions as Range, Shift and TVG.